Longlines and cages on an oyster farm in Southcentral Alaska. To engage in aquatic farming activities, persons are required to have the permits listed below. Department staff are available to provide people with technical, regulatory, and planning services related to aquatic farming in Alaska. To learn more about Aquatic Farming in Alaska, please visit the Aquatic Farming home page. To operate an aquatic farm, shellfish nursery, or hatchery in Alaska, a person needs to obtain an Aquatic Farm Operation Permit. An operation permit is issued for a 10-year period with renewal subject to review before being issued for another 10 years. A permit holder can transfer an operation permit to another person, by request, at any time. To transfer aquatic farm stock to, from, or between an aquatic farm, hatchery, or nursery site, the permit holder that is receiving the transfer needs to obtain a Stock Transport Permit. A permit holder must submit an application form to the department at least 45 days before date of transfer. Once issued, the permit is valid for the calendar year. To collect wild stock from outside an aquatic farm site, in order to provide broodstock to a hatchery, the hatchery permit holder must obtain a Aquatic Stock Acquisition and Transport Permit. A permit holder must submit an application form to the department at least 30 days before the proposed acquisition. Once issued, the permit is valid for the calendar year. This permit is required by hatcheries acquire broodstock used for propagation purposes. 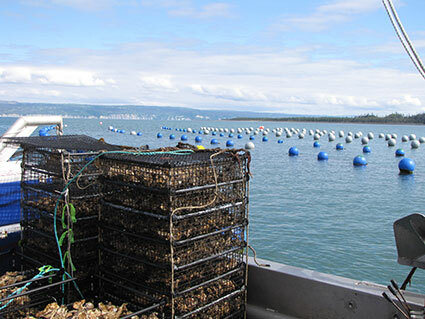 To distribute shellfish seed to a permitted aquatic farm, nursery, hatchery within Alaska or for export, an instate facility is required to obtain a valid seed source approval issued by ADF&G. An acceptable disease history specific for the facility site and the shellfish stock is required prior to allowing stock to be transported. Once issued, these approvals are valid for one to three years, depending on the disease history of the permitted facility site. To import Pacific oyster seed ≤ 20 mm into Alaska for use at permitted aquatic farm, nursery, hatchery, a facility is required to obtain a valid certificate to import issued by ADF&G. More extensive pathology examinations are required for out-of state facilities in order to minimize the risk of exotic pathogens of concern entering into Alaska. The certifications are facility, site location, and stock specific. Certifications are generally valid for one year from the date of sample collection for pathology examinations.